When Mt. Schweitzer is covered in clouds, there is no internet service. So, glance out the window before going on the computer. Having a Direct TV dish does not mean you receive television channels, especially ESPN, and you need to spend Sunday at Sweet Lou’s if you want to watch football. Ecofans do not need batteries or electricity. They only need a hot stove. Snow shoes are needed to beat a path to the sauna. People do live in yurts, which is like camping all the time. These round, glorified tents have canvas or vinyl on the outside and wool felt on the inside. They sit on wooden platforms. Yes they are cold, so keep the wood stove lit. 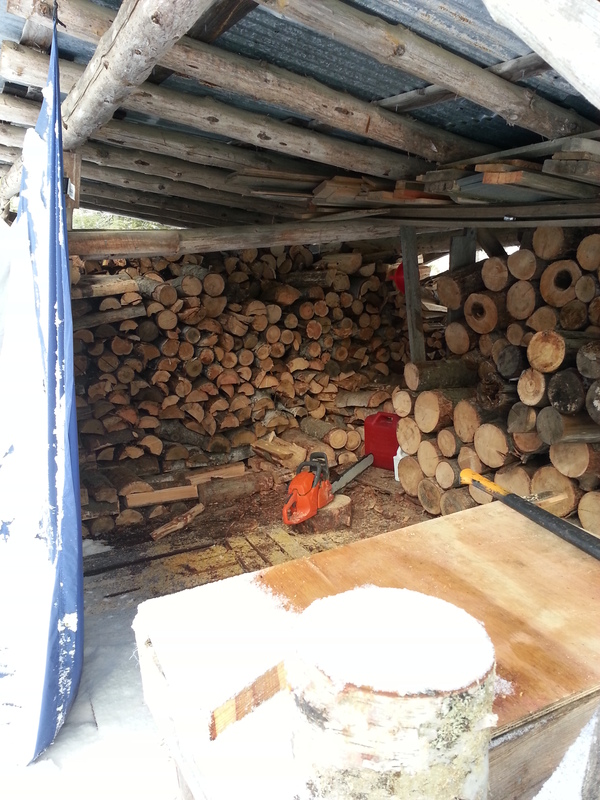 Having a well stocked wood pile is like having money in the bank. Moose like to hang out in wet, low-lying areas and can devour five or six aspen saplings in ten minutes. This cow and calf were spotted before the snow hit. We had two blizzards and three feet of snow in ten days. Homemade igloos could double as a smokehouse for local trout. Lastly, everyone in North Idaho is friendly and helpful. I believe it is because they are surrounded by breathtaking beauty and because they live so very far away from Washington D.C., where I must soon return. Cleaning and writing are both attempts to place order in the midst of chaos. Cleaning addresses my physical world, writing addresses my mind. Both provide immediate satisfaction. Plenty of disruptions abound when writing, as everyone easily finds me at my laptop. No one bothers me while I roar about with the vacuum. The problem is, cleaning does not last. Meals pass and the kitchen floor is once again full of crumbs. Family members whirl about creating dust. Hair and toothpaste splatter the bathroom. Clutter arrives with the daily mail and a new sort of mess arrives with the Christmas tree. Pretty as it is, there are pine needles. Because writing lasts, unless I forget to ‘back up’, which is my greatest fear instead of mildewed tile, I choose writing. I still clean, however my emotional investment is far less. Now as I breeze through the house with a dust rag, or the vacuum, my head is full of ideas and composition. I don’t care when shoes reappear by door, coats return to the newel post, or crumbs return to the kitchen counter. I have words to write and thoughts to think. This year, I especially expect the two to peacefully coexist because I have skipped the Christmas tree, hopped a plane from Virginia with most of my family, and landed in north Idaho at my daughter’s house. Overnight, more than a foot of snow has socked us in. A fire is blazing in the stove, wood chips are everywhere, puddles by the door, and my laptop is on the coffee table. After I hit ‘publish’, I will do a little sweeping, smile at my daughter as she makes tea, and think about that tricky scene in my novel and how to resolve the stilted dialogue. Independence and autonomy sent my parents to South Bend, Indiana from Michigan when I was two years old. They needed to regain the freedom they’d enjoyed as students at Michigan State. Inexplicably, both sets of parents were criticizing their parenting choices, dropping in at all hours, and calling the police if more than a day passed without a phone call. I remember an exciting move to a newly constructed house, on a street full of kids, on the eastern edge of Notre Dame’s campus. Peachtree Lane pooled in a cul-de-sac toward the wooded campus, but it began on Ironwood Road. This forbidden boundary, a two-lane artery, shrouded in lead exhaust, hosted traffic as steady as a pop-over jump rope. To reach Edison Elementary, we needed to cross it. Taking a detour to the crossing guard crimped our style. With the good toe planted on the edge of the curb, arms raised, eyes scanning right, left, right, left, we’d hear heavy metal bearing down on thick tires. Like the whirling jump rope, we’d wait for our chance. “Go!” We’d span the asphalt, spurred by fear. Every crossing raced my pulse and stabbed my heart. I always breathed a sigh of relief to gain the opposite sidewalk. Ironwood hugged us to the University. Like a strong-arm, it gathered our senses toward marching bands, referee whistles, crowds roaring, and Good Year blimps hovering. On game days, we lined Ironwood’s sidewalk and rattled newspaper pom-poms, stained in thick blue and gold paint. We sang the Fight Song for laughing, drinking adults hanging out car windows. Frequently, they tossed us extra tickets. We’d hop on our bikes and head for the stadium, not needing to cross. For ten years, my confidence grew with every crossing while Ara Parseghian led Notre Dame to consecutive wins. On New Year’s Eve, 1973, TVs tuned to the Sugar Bowl in New Orleans. Our team faced Alabama as a football independent. It was a nail-biter. When the victory occurred we headed outside to hear the campus roaring. We met silence instead. Huge fluffy flakes, fresh from Lake Michigan, muffled the winter night. They floated gently as white kaleidoscopes on wool coats, doily patterns on black asphalt, and knitted white rows upon bare branches. We knew our boundary would soon span across town to John Adams High School. We sensed the end of Ara and the beginning of Devine. But, as snowflakes collided in the night and stacked into airy piles around us, we reveled in our own quiet victory of independence and autonomy. We slowly walked the center line of Ironwood Road. I did not rise to the “National Novel Writing Month” challenge because I already have too many words. Devotion of thought is what I need for adjustments, alignments, and augmentations: “Thought + Time = AAA.” Congratulations to my real life and cyber friends for heading in the write direction. Today begins 3 days of the North American Christian Camp Conference in San Diego where SIX autographed copies of Memory Lake will be given away, and promoted, hopefully for a bump in sales, so my publisher will be willing to give one copy to EVERY attendee next year for their 75th anniversary Conference! This year’s theme is, “Only be strong and courageous.” Joshua 1:18 Which is a great mantra for my NaNoWriMo friends in the next phase of their amazing accomplishment; EDITING.